Home » PEX Supplies » Installation Accessories » Copper Stub Out Elbows » Copper Stub Out Elbow for 1/2" PEX-A Tubing (F1960), 8" x 4"
Copper Stub Out Elbow for 1/2" PEX-A Tubing (F1960), 8" x 4"
The 630WG248 from Sioux Chief is a Copper Stub Out Elbow for 1/2” PEX-A tubing. 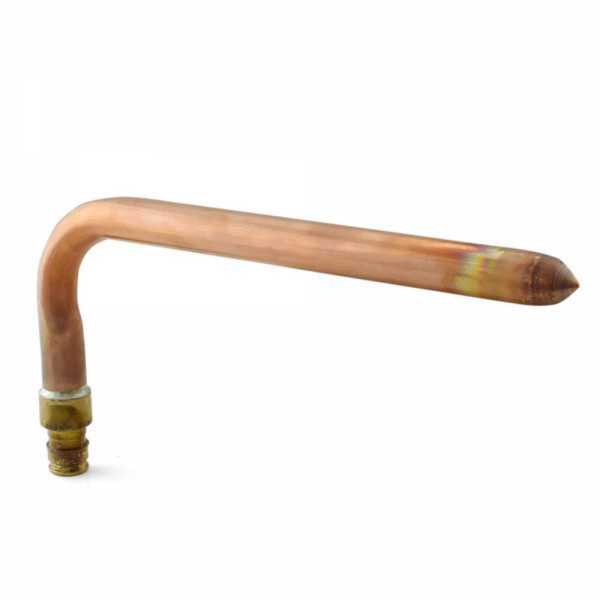 This item allows the transition between PEX-A tubing and copper pipe to stub out of the walls and floors. Spin closed outlet allows for pressure testing before installation of stop valves and prevents dirt and debris from getting inside the pipe during construction. •Compatible with 1/2” sweat or 5/8” OD compression stop valves. •Height (part w/ PEX outlet): 4”. •Can be connected to other piping (PEX, CPVC, etc.) by using 1/2” female sweat adapter. •Approved for potable water use. •Saves on installation time and costs. Height (part w/ PEX outlet): 4"